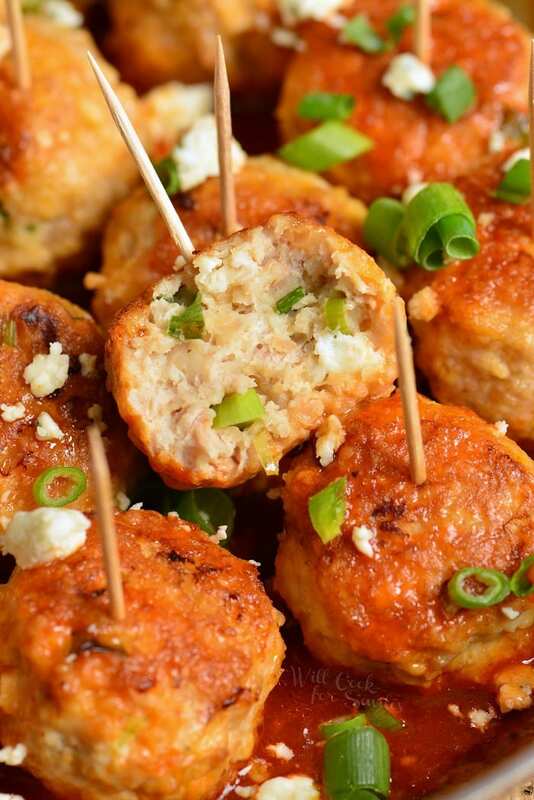 Buffalo Chicken Meatballs make a wonderful appetizer that’s bursting with flavors. 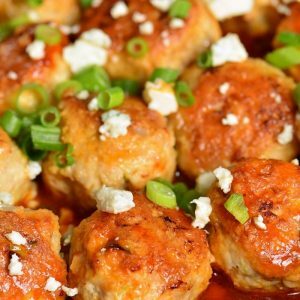 These juicy chicken meatballs are made with blue cheese crumbles and buffalo wing sauce inside and cooked in some more buffalo wing sauce. 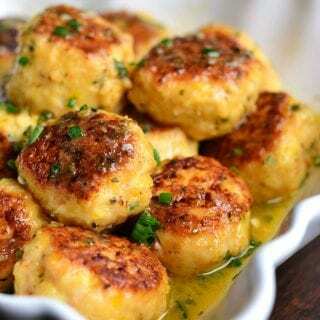 Chicken meatballs are light but so juicy and flavorful. 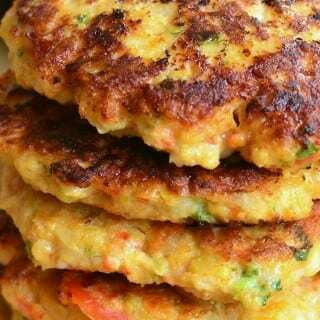 They are great to serve at parties or as a light dinner with a salad. Buffalo wing sauce makes such a great flavor combination and if you like it as much as I do, you will really enjoy these recipes for Buffalo Chicken dip, Buffalo Chicken Nachos, and and Buffalo Chicken Wrap. If you’re feeling adventurous, try my Buffalo Chicken Burgers because they are amazing. 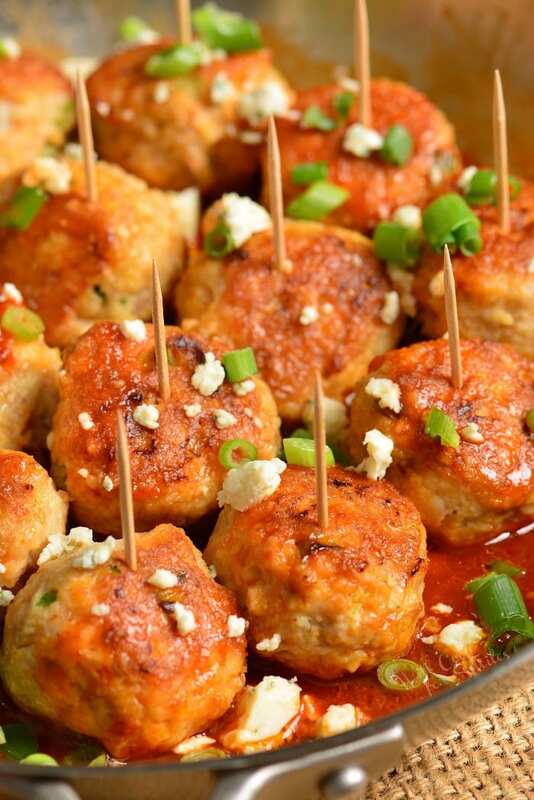 Buffalo chicken meatballs is another great recipe to enjoy that wonderful flavor combination that’s become a food classic. Like peanut butter and jelly, like tomato soup and grilled cheese, buffalo wing sauce and chicken go together perfectly. These juicy chicken meatballs is a winning recipe for this flavor combination. They are absolutely fantastic. 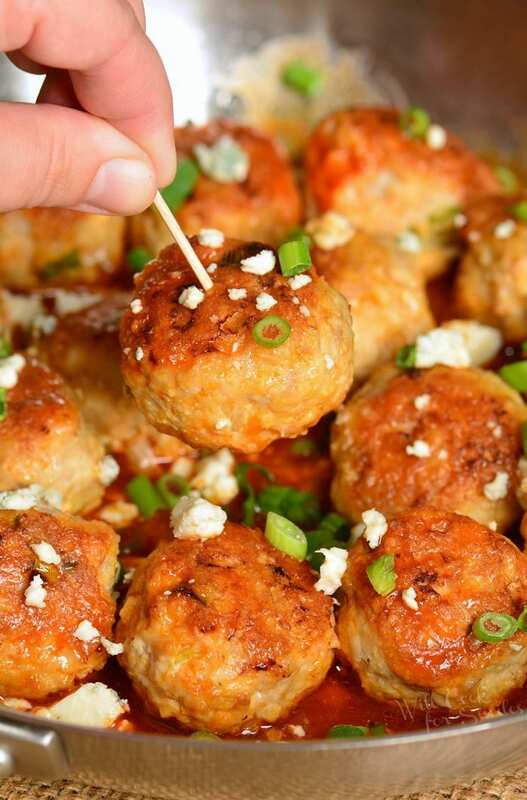 Adding blue cheese crumbles, green onions, and some buffalo wing sauce right inside the meatballs infuses them with a lot of flavor. Meatballs always make a popular appetizer at a party and these meatballs will be a huge hit, even with people who don’t like spicy food. Spice levels actually can be easily adjusted in this recipe by choosing mild, medium, or hot sauce. Spicy meatballs can also be served with some ranch or blue cheese dressing for dipping. 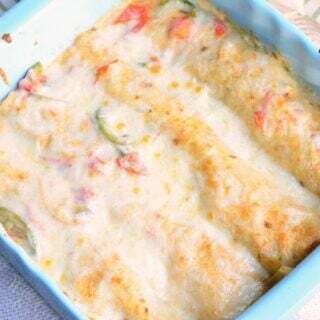 Creaminess of the dressings is great for dulling the spice and the flavors pair perfectly with buffalo wing sauce. Adding onions to the meatball mixture helps keep them juicy and tender. Make sure to mince onions into small pieces so there are no big chunks of onions in the meatball. Using a cookie scoop to measure meatballs will help keep all meatballs the same size. This will ensure that the meatballs are cooked evenly. Grease your hands with a little oil when rolling meatballs. Roll meatballs first, before adding to the pan so that all the meatballs are added at the same time and cook evenly. 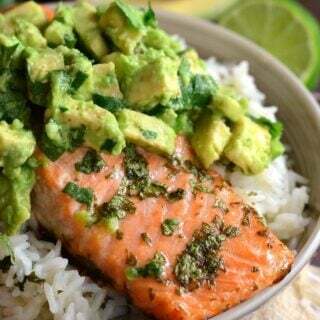 Use a pan that can easily go from stove-top to the oven. Sear meatballs first before baking them for extra flavors. When choosing the buffalo wing sauce, choose mild, medium, or hot depending of personal preference. Choose Buffalo Wing Sauce, don’t try to substitute Sriracha or other hot sauces as they have very different flavors. Top off with blue cheese crumbles. This will add great cool flavor to the cooked meatballs. Combine ingredients for meatballs and mix them together in a bowl until all evenly combined throughout. Use #40 (or a little bigger or a little smaller) cookie scoop to scoop out meatball mixture and roll them into meatballs. Make sure to grease your hands with a little oil to easily roll the meatballs. Place meatballs on the cutting board or parchment paper. When almost all meatballs are rolled, preheat a large, oven-safe cooking pan over medium heat. Add some oil to the pan and add all the meatballs. Sear meatballs on one side until browned and then turn them over. Sear for another minute and add buffalo wing sauce. Transfer the pan with meatballs into the oven and bake for about 15 minutes. You can simply cut into one of the meatballs to check if it’s done. Take the pan out of the oven and top the meatballs with some more blue cheese crumbles and chopped green onions. These meatballs make great appetizer but you can serve it as a meal for lunch or dinner as well. When serving it as an appetizer, serve it with some celery sticks on the side and a choice of dipping sauces. Ranch and blue cheese dressing are the best paired with these meatballs. 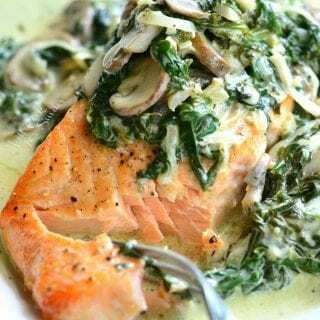 If ranch or blue cheese dressings are not available, you can simply mix some sour cream with green onions, herbs, salt, and a little milk to make a simple dipping sauce. To make these buffalo chicken meatballs a complete meal, serve them with a side salad or roasted vegetables. 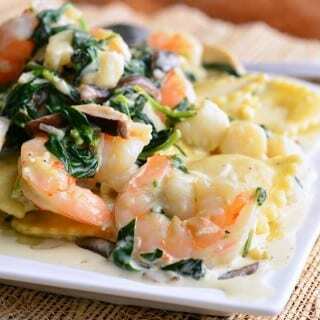 Ranch or blue dressings will pair very well with the salad and vegetables. 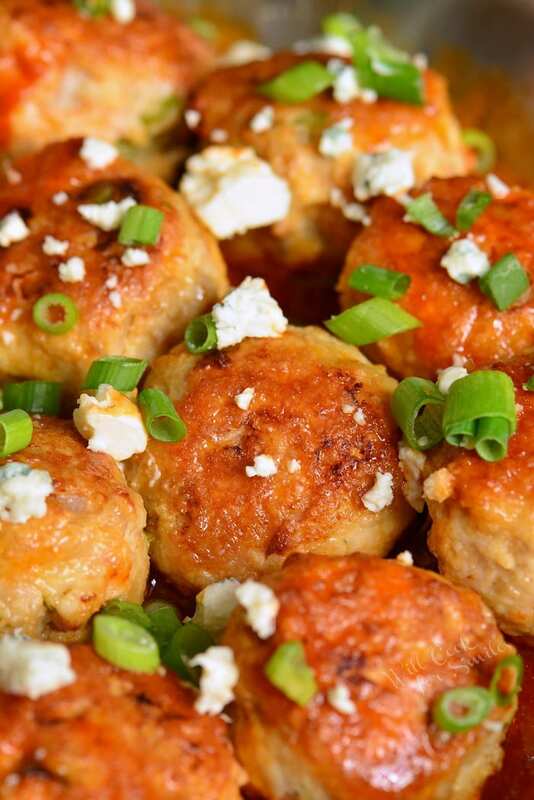 These juicy chicken meatballs are made with blue cheese crumbles and buffalo wing sauce inside and cooked in some more buffalo wing sauce. Use #40 (or a little bigger or a little smaller) cookie scoop to scoop out meatball mixture and roll them into meatballs. Grease your hands with a little oil to easily roll the meatballs. Place meatballs on the cutting board or parchment paper. When almost done rolling the meatballs, preheat a large, oven-safe cooking pan over medium heat. 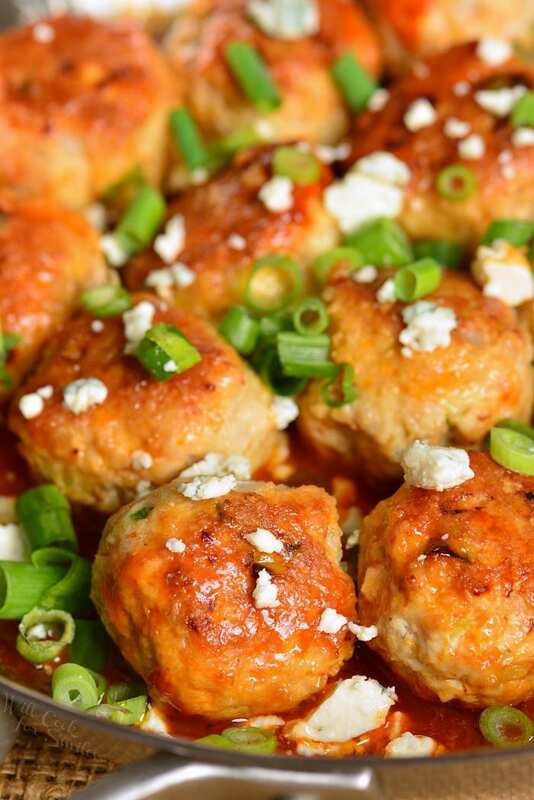 GLUTEN FREE OPTION: to make these buffalo chicken meatballs gluten free, simply substitute bread crumbs for gluten free bread crumbs.